Habitat: Desert, Upland. 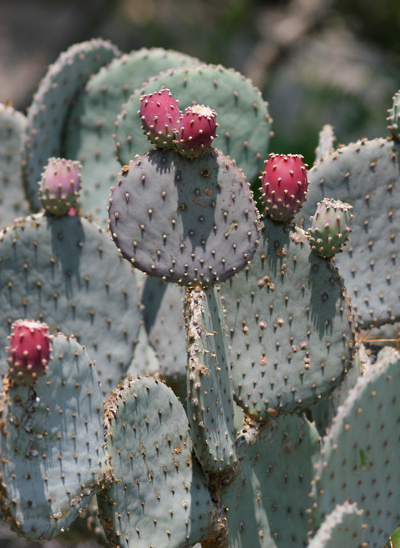 This attractive cactus is especially common in the foothills of Arizona's Santa Rita Mountains. Description: The flowers are up to 3 1/2 inches (7.6 cm) wide and have solid yellow tepals, pale yellow anther filaments, and a whitish style. The flowers are followed by egg-shaped to barrel-shaped, glochid-dotted, reddish to purple fruit. 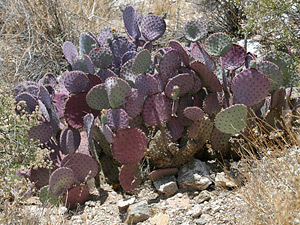 The stem pads are flattened, round, usually spineless, dotted with aureole glochids (sharp micro-spines), and blue-green, purple, or magenta in color. The stem pads turn a brighter purple color when stressed by cold or drought and are a green color when conditions are better. 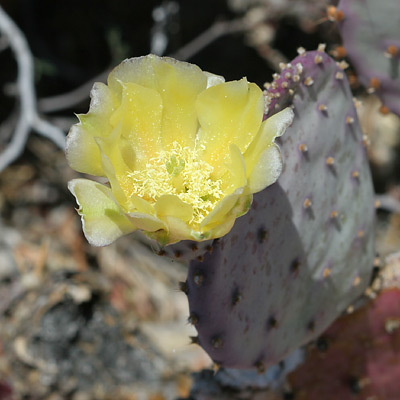 The similar Purple Pricklypear (Opuntia macrocentra) has flowers with red at the base of the tepals and usually has spines, mainly at the top edge of the stem pads.